Touch on. Touch off. With Touch2O<sup></sup> Technology, it doesn't matter if you have two full hands or ten messy fingers. Tap anywhere on the spout or handle of the faucet with your hand, wrist or forearm to start and stop the flow of water. Thoughtfully designed to make kitchen tasks easier, Touch2O Technology allows you to turn the faucet on and off with just a touch anywhere on the faucet's spout or handle. It was the first innovation of its kind on the market, and now offers more styles, finishes and options than ever. Designed for precise, responsive control every time, no matter where you touch. You can easily control and change the water temperature above the deck using the faucet handle. All Touch2O models are water-efficient, underlining Delta's commitment to conservation. Only Delta faucets are equipped with Touch-Clean<sup></sup> soft, rubber nubbins that allow you to easily wipe away calcium and lime build-up with the touch of a finger. Single Handle Pull-Out Kitchen Faucet with Touch2O(R) Technology, Stainless Steel Touch on. Touch off. With Touch2O<sup></sup> Technology, it doesn't matter if you have two full hands or ten messy fingers. Tap anywhere on the spout or handle of the faucet with your hand, wrist or forearm to start and stop the flow of water. Thoughtfully designed to make kitchen tasks easier, Touch2O Technology allows you to turn the faucet on and off with just a touch anywhere on the faucet's spout or handle. It was the first innovation of its kind on the market, and now offers more styles, finishes and options than ever. Designed for precise, responsive control every time, no matter where you touch. You can easily control and change the water temperature above the deck using the faucet handle. All Touch2O models are water-efficient, underlining Delta's commitment to conservation. Only Delta faucets are equipped with Touch-Clean<sup></sup> soft, rubber nubbins that allow you to easily wipe away calcium and lime build-up with the touch of a finger. 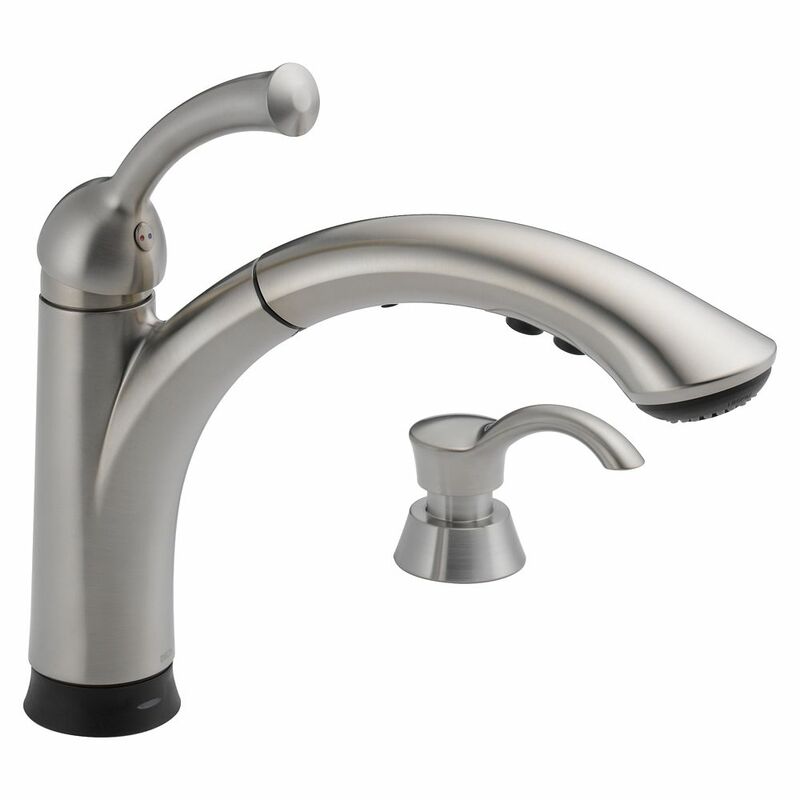 Single Handle Pull-Out Kitchen Faucet with Touch2O(R) Technology, Stainless Steel is rated 3.8 out of 5 by 31. Rated 5 out of 5 by Mamas from This Faucet is Beatiful We love this new faucet, we changed all our appliances to stainless and this faucet matches perfectly. Rated 4 out of 5 by Landman from Replacement faucet Faucet was securely packaged and directions were easy to follow. Faucet was easy to install and works well. Overall very happy with the product. The only fault I have with it is it should be a little higher above the sink and a little further back from the front edge of the sink, more centered in the sink. This is the reason I did not give it a 5 star rating. Rated 3 out of 5 by Loisy52 from Help I had this Delta 16926T-DST installed in my new kitchen in June 2013. I have liked it but never had to replace the batteries many times and now the lights don't work at all, the water sputters before it comes out sometimes. Id like to have it fixed. Can you help me?